I've roasted two chickens in the past week. One on the day I got back from Milwaukee, because Alex had school and I wanted something hands-off with very little prep work, and one again the other day because the last one was so delicious. I used Thomas Kellers recipe, found on Epicurious, and it makes a perfect, juicy chicken with crispy skin. The first time I made the chicken I followed the recipe and made a pan gravy with butter and mustard, it was awesome. The next time I made a pomegranate gravy, which was also awesome. Basically, this is how I will be making chicken from now on. Sorry for the poor photos, I took them late at night and have crappy lighting in the kitchen. I'm going back to work next week. I'm a little bummed, but also a little relieved. Four months sitting around the house gets to you. And I sure am broke. Preheat oven to 450. 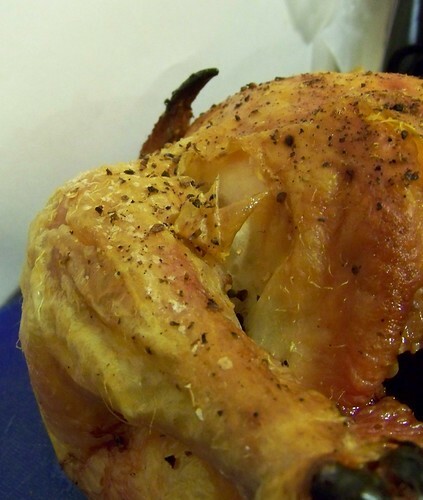 Rinse chicken and dry well with paper towels. Generously sprinkle with salt and pepper, inside and out. Truss chicken, then put in a cast iron pan. Roast 60-70 minutes, until chicken is cooked (temp 160 or higher, juices run clear, and/or legs move fairly easily if you twist the drumstick bone). Remove from pan, let sit for 15 minutes while you make the gravy. Pour most of the grease out of the pan, leaving a little over a tablespoon. Heat pan over medium heat, whisk in butter, and when it's melted, whisk in rice flour. Cook 1 minute, then add pomegranate juice and chicken stock. Whisk until thickened, taste for salt and pepper, and serve over chicken, with a few pomegranate seeds if you wish. "truss"? explain. "until it's cooked"? explain. these look so pretty but this does not tell me how to roast a delicious chicken!help!! !